Marvel Legends Series 6 returns to the trend begun in Series 2: multiple figures released under a single name. Because the bio has to refer to two characters, it doesn't really tell you anything. This figure is Z2P45-9-X-51, a sentient robot created for the Army by Dr. Abel Stack. The first 50 went insane upon gaining sentience, but X-51 made it through because Stack treated him like a son (and also he was exposed to a Monolith - remember, Machine Man was a spinoff of Jack Kirby's 2001: A Space Odyssey comic). The Doc died trying to protect him, so he named himself Aaron Stack after his "father" and went on the run from the government. He eventually joined the Avengers, helped the X-Men fight Red Skull, was infected by Sentinel nano-technology which caused him to attack any mutants he met, and was taken into space by the Celestials (who were the power behind the Monoliths). 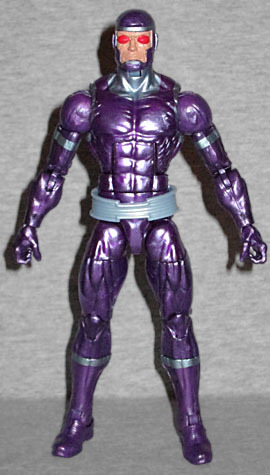 Machine Man uses that body Hasbro uses for everything, this time painted in metallic purple - in other words, it's his original Kirby design, not his more recent Nextwave costume. There are silvery-blue bands painted around his shin, biceps and neck, a free-floating silver belt, and his eyes are large red bulbs against Caucasian skin. Both Aaron's hands are open to hold something, but he has nothing to hold - though that's not to say he doesn't have any accessories! One of his flashier powers was the ability to telescope his arms and legs, "Inspector Gadget"-style, so the toy comes with extenders that plug into his wrists. Since his hands were already coming off, they also gave him an extra pair of fists. Nice work, Hasbro! He also comes with two of the arms for this series' Build-A-Figure, The Allfather. Yes, the BAF has more than two arms. It's a whole thing. Don't worry, we'll discuss it when we actually review him. The arms have pivoting shoulder armor, and the left arm is entirely covered by banded metal. It looks pretty cool, and we can't wait to get to the end of this series so we can tell you all about it. Machine Man may be the unlikeliest character to ever get a Marvel Legend, and he's really been done nicely (even if I'd rather have the Nextwave version, there's no question that the Kirby design is more iconic). Now, continue on to Page 2 to see who the other "Avenging Ally" is.